(Seychelles News Agency) - Six Sri Lankan nationals are being held by local law enforcement after their fishing boat was intercepted on suspicion of fishing illegally in the waters of Seychelles, said the Seychelles People's Defence Forces (SPDF) on Monday. The Sri Lankans nationals appeared in court last Friday and will remain in custody for 14 days. 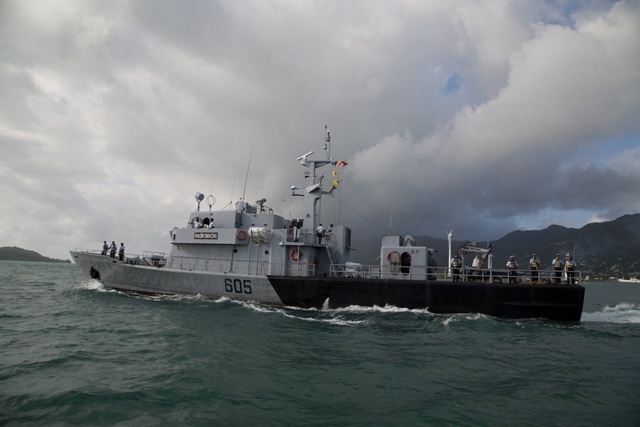 The Sri Lankan-flagged vessel was spotted by Seychelles Coast Guard patrol ship Andromache north-west of the main island of Mahe during a routine patrol last Thursday, June 7. A Coast Guard team was subsequently sent on board the suspected vessel to conduct an inspection, during which evidence relating to illegal fishing was observed. The vessel which arrived in Port Victoria on June 8 was handed over to the Seychelles Fishing Authority and the police. The Seychelles Fishing Authority is assisting the police in gathering evidence as to the species and amount of fish found onboard the Sri Lankan vessel. This is the second recent incidence of illegal fishing by Sri Lankan nationals in the waters of Seychelles. Last month, the Sri Lankan news channel ITN News reported that a fine of 20.5 million rupees ($1.5 million) had been imposed on a group of Sri Lankan fishermen for violating Seychelles’ maritime borders. Seychelles, a 115-island archipelago in the western Indian Ocean, has a vast Exclusive Economic Zone (EEZ) of more than 1.37 million square kilometres, and regularly faces illegal fishing problems.